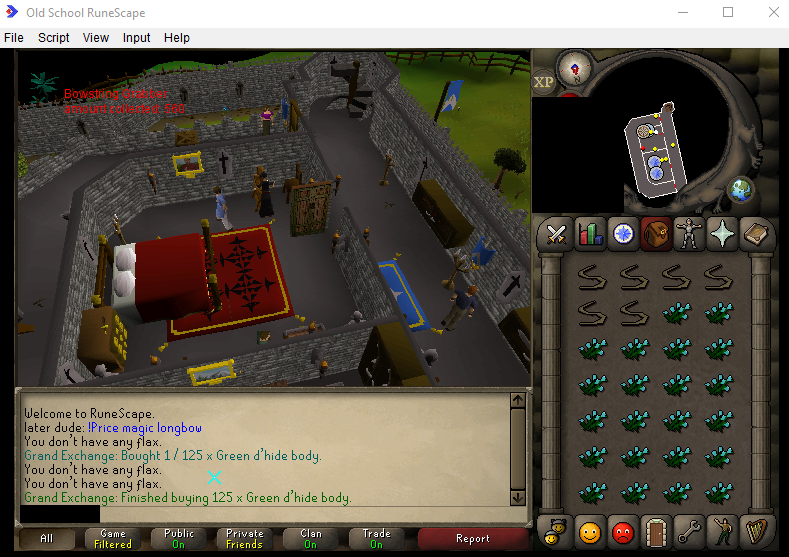 Spins flax into bowstring at lumbridge castle. Start at lumbridge bank with flax in the bank. How long have you tested this for? 5 minutes just now but I've used the script for a month straight last year december. This was a private script I wrote for myself but never released. Fixed it up and released it just now. If you have any problems with the script just post them and I'll fix them. Okay, I'm gonna buy VIP and let it run tonight while I sleep. Lets see how this goes. I apologize. I should have tested more. There was a single line of code that did not update causing the script to fail to detect flax in the inventory. Should be working now. Here is a test I ran just now. Will test over the weekend. Proggy incoming. it works well for about 200 flax, but then it just stands in the bank and stops. What the script does is detect if the bank still has flax left and if it does not detect any it will stop the script. Looks like there is some lag that prevents the script from detecting the flax. I will increase the fail margin on the detection. Running it right now, currently at around 300 with only 1 problem. When checking if the door is open or closed sometimes it will open the door to the next door to the North and then run to spin flax. Not a big problem, though. Also the text is a little hard to read, bright yellow would probably be more legible. Great work! Anyone activity using this, with any success? busy week so update took a while. Text changed to yellow for better visibility. Bank walking changed for more natural movement. stats on the script shows around 40-50 users a day. I gotta say dude, I'm sorta upset, I ran this for eight hours over the past two days on an account I don't normally bot on, and I got a day ban..